Introducing DURAGADGET‘s new rigid zip case for your camera. With a soft, felt lining and durable outer shell, this case provides maximum protection for your device. The executive looking case features a sturdy dual zip-closure to the main compartment, lending extra security and ensuring your camera is kept dust and scratch free. Water and shock resistant material to give you peace of mind about the safety and security of your camera. This sleek case is finished in a deep purple, so you can transport or store your precious device in style. 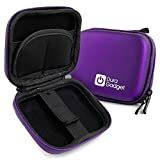 This entry was posted in Discount Photography and tagged Camera, Carabiner, Case, Clip, Compact, compatible, DURAGADGET, Hard, Premium, Purple, Quality, S126, Shell, Twin, Vivitar, XX128, Zips by Ball Photo. Bookmark the permalink.